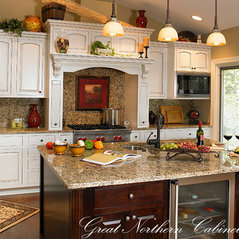 Located in the heartland of Wisconsin, Great Northern Cabinetry has been in the business of making fine quality cabinetry since 1972. The strength of our company lies within the responsiveness to the needs of our customers. 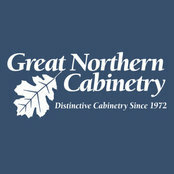 Great Northern Cabinetry is fully dedicated to providing the finest semi-custom cabinetry for your home with features rivaling the most custom products in the market. Remarkable Quality - by combining experienced craftsmen with exceptional materials, Exceptional Flexibility - to create a beautiful custom quality kitchen at an extraordinary value, Dependable Delivery - 95% record of meeting scheduled dates to ensure you meet your project timeline. Commented: What's the stain on the island?The contrasting color of the surrounding cabinets is Frosty White with Brown Glaze. Commented: What door style is this?The door style in this kitchen is Independence inset and features frosty white finish on maple wood.